What follows is a very rough transcript of the video referred to here and embedded below. Sorry, folks. It’s late and it’s lazy. The following entry contains gender, pop song music videos, and spoilers for the television series Once Upon A Time. I feel like I’m tracing an unnecessary line between “official” media and “fan works” (fanfiction, fan art, and filk music) when I say that right now Christina Perri is the High Queen of All Filking. Between those two categories, of course, there’s going to be commissioned works and borrowed influences in the realm of Official Media. I’ve also got the feeling that I really shouldn’t care about Perri as a person, persona, or personality because I shouldn’t partake in that culture of entitlement for any of those being my business. Perri makes music. I buy her albums or concert tickets, or I don’t. I enjoy her music when I hear it on the radio, at the mall, or in the car with my extended family, or I don’t. If she likes to knit or something, and blogs about her life that occasionally involves knitting, then I might look up her blog whenever I remember…or I might get bored at the lack of knitting. So, with that said, I meta-squee that she’s also a fan of ABC’s Once Upon A Time, and especially of their version of Captain Hook, played by Colin O’Donoghue. And guess who she got to be The Guy in her latest music video, for a song that could very well have been written from the point of view of what character on which television show? Besides, I would now speculate that this creative process gained an entirely other dimension, because the music video tells an entirely different story… and it’s just confusing. Beautifully filmed, that is, but open to interpretations. Interpretation Number Zero: Christina Perri is playing a deceased human ghost, like the guy’s dead girlfriend that he can’t bring himself to think of as an ex. Not very cohesive, given the song and everything we’re shown, so I am immediately scrapping this. Interpretation Number One: Princess Abigail (alter ego Katheryn Nolan, canonically) from Once Upon A Time dyed her hair black in some alternate universe where Captain Hook (alter ego Cody Fisch, made that one up meself) got caught up in the first Fairy Tale Characters Reincarnation Spell. Perri looks so much like Anastasia Griffith at some angles, though…this fanfic must happen. Wait, what? No. How the…did that even…?? How does she disappear? Why would he be ignoring her that hard when she’s in his home and in his bath tub? Obviously, this is an interpretation I’ve read other people take. Not like that, that one’s fun. More like, the main voice’s insistence that the addressee feels the same attraction, but is in some way wrong about their (the addressee’s own) personal boundaries, but maybe that wrongness can be adjusted if the main voice can regale the addressee with “all the hell I had to go through” pain of unrequited love. It’s very, very difficult for me to say how different that is from dealing with someone you love, who loves you back but tends to pull away because of low self-esteem or something…but it is different. And I want to say that it’s completely different, but “The Words” isn’t all of one, there are several lines that I would also consider a celebration of empathy, autonomy, and consent. So, the notions would be completely different but frequently mixed with each other. I don’t even know what’s going on up there. “The Words” is comparatively benign. Just hanging this here to justify this entire post’s presence on my woo-woo metaphysics blog. That interpretation might also make the second most sense of the music video, either as conscious astral projection through space into someone’s crush’s bathroom, which is less than cool; or projecting, perhaps unconsciously, through time, from a future where this guy who is dissatisfied with life in general will soon meet with somebody that will change the aforementioned dissatisfying life. I’ll get back to that last one. Interpretation(?) Number Four: The video is about a guy who cant stop thinking about the girl he keeps seeing at the flower shop. He is so torn with his feelings and she haunts him the way love does…finally at the very end he finds the courage to say hello and let himself love her. That’s the explanation on Perri’s Facebook page, hence the question mark if the intent of the creative process still counts as interpretation. I’ve picked up on these ideas about storytelling media such as that, even with an official work that has an official creator, it’s only ever the way that it is taken (by the audience) that determines what message is conveyed. But looking to the word of the official creator, at least, I think clears a lot of things up. The entire thing is an inner struggle between romantic inspiration, and the less inspired spaces that purport to be safer…and how we can try to cling to that safety, even if it means that we go to war with ourselves. Interpretation Number Five: So, I’ll take Interpretation Number Four and the other interpretations I like best. It is not this “She” who haunts him, of course, but his idea of this “She” who is…borrowing from Jungian psychology…himself. Basically, his Anima. In Jungian psychology, there’s this idea that romantic love is the product of somebody else carrying the projections of our own psyche, that is, manifesting the qualities that we would admire for remaining unrealized within our own personality—that self-actualization having an unmet need that our psyche attempts to fulfill by generating a romantic attraction for, or attachment to, another person. In men idealising women, that ideal is known as an Anima. In women idealising men, that ideal is known as an Animus. From the little I know of Latin construction, to queer this binary would be properly known as an Anime, which would inevitably get confused with Japanese cartoons, especially if the actual Anime were modelled after or influenced by anime. In this estuary of complication, it then makes a lot of sense that this very form that is haunting him is egging him on to make her real in his life. In the form of his intended, the Anima pronounces or echoes his perspective of the intended, as it would, even though that presents as very strange. On a tangent, I could even connect that to another metaphysical interpretation: There are quite a few people out there who develop deep and fulfilling bonds with incorporeal figures such as this. Commonly, as I’ve read, these incorporeal figures promise their corporeal lovers that they actually are both corporeal and it’s just a matter of finding them and/or awakening their consciousness in the corporeal world, because the incorporeal forms are subconscious projections of that person, or the higher selves of that person, or something similar. The thing is, the details of a work create the structure that would lead the audience member to the point or purpose of the work: emotionally, thematically, what have you. Contrast this with “Funny Little Frog”, where that guy is obviously having a lot of fun with his romantic fantasies, even as that coasts on longing. Because unrequited love can be awful, but I don’t know about it being that awful. It’s not quite impossible, though. Especially if, as mentioned, the subject is going to war against themselves and especially against their own inspiration, because of low-self esteem, or taking a cerebral cue rather than an instinctive cue to avoid trauma. That would be about as awful as shown. The Anima, instead (or in part,) becomes the Jungian Shadow. “An open heart is an open wound to you” is, perhaps, the Anima singing to the guy about himself, or to him, rather than feeding him the words that he could speak to his intended, or talking about herself—as much of a self as an Anima can have. Another thing about the dual symbolism that I drafted for the ogdoad (my elemental system) of Queen is, personally, it demonstrates the sort of journey that I took to personal empowerment, the turnkey moment being: I was not going to conform. I could never please anybody else. This wasn’t a bootstraps-pulling decision. It was despair at the inevitable. There would always be some notion that I would be too much of one thing, and this would sustain into something else coming in to mean that I’m not enough of that exact same thing. The dual pressures can tear a person apart. That’s shown in the above picture, the symbol on the right, one of the Queen restrained. So, if I can’t do anything right, then I may as well do what I want. (Now if only I knew what that was…) That sentiment would be symbolized by the sigil on the left in the image above, one of the Queen radiant. In any case, that was the alchemical process of authenticity that I’ve experienced firsthand, and I might not be alone in it. As someone told me lately, imagination is what saves us from merely fitting into the roles we’re shown and given. It’s within the domain of expressive imagination that one can authentically be oneself. 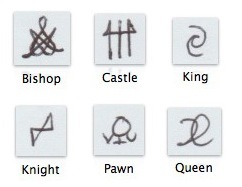 So, I finally got all the symbols for the chess pieces! I call this elemental system The Poesy Ogdoad, even though there are only six elements, because a chessboard is an eight-by-eight grid. I don’t know what to do with these, yet, I’m just hanging these here. Maybe I can think of diacritics around the sigils to indicate exactly which sound under each group would be represented. If I count G as a combination gutteral between K and H, (also D as a combination of L and N, just because, but it won’t really change the file count) then the file of sounds from gutteral to sibilant would be twelve. I could structure the diacritics, then, like the hands of a clock.